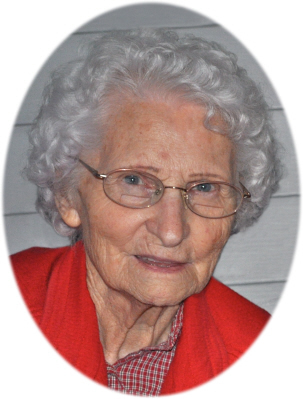 Myrtle Marie Foor, 95, of Vestaburg, MI passed away peacefully on November 30, 2018 at the home of her daughter and son in law, Donella and Ray Peasley, where Myrtle has been living for over 2 years. Myrtle was born on August 23, 1923, into a large farm family south west of Shepherd, MI, the 6th of 18 children born to Edna and George Shattuck. As a girl, she was part of the Shattuck work force – planting, weeding, and harvesting crops, clearing land, hauling countless pails of water to the house from the barn pump etc. etc. All was done in proper female attire – a dress. Also deemed proper for girls, she grew her brown hair long, pulling it back into two braids that hung down as a girl and were wrapped around her head Swiss style starting as a young woman. She did not cut her hair until in her 60s. She was known for fearless escapades including break-neck barrel rolling and tree climbing. This led to her being drafted by her father to drive the team of intimidating work horses after her older brothers left home. With no access to a high school, Myrtle, like many of her sisters, moved out after 8th grade to work as a housekeeper. At age 20 she met the love of her life, Wilbur Foor. They married in 1944, had four children and were together until Wilbur’s death in 2006. After exploring a co-op community in North Carolina and living on a small farm near Shepherd, they settled on a farm near Vestaburg, MI in 1955. Myrtle was a full indispensable partner in the family farm enterprise. She raised and preserved most of the family’s food, including chickens, eggs, fruits and vegetables and fully participated in cutting and splitting wood for heat. She had an extraordinary gift for stretching dollars to achieve a lifestyle that surpassed the farm’s modest earnings. She shopped sales and thrift shops, clipped coupons, saved anything that could be reused, baked her own bread (and many other delicious baked goods), bought fruit in season by the bushel for canning or freezing etc. etc. Dearest to her daughters’ hearts, she recreated the must-have, but couldn’t-afford fashions they loved – pulling a sleeve design from one McCall pattern and a bodice design from another in a stroke of sewing wizardry. As described in the 31st chapter of Proverbs, her children rose up and called her blessed. In her later years, she became an avid quilter, creating quilts for family members (including possible future grandchildren) and for the annual auction of her beloved Shattuck family reunion. She was a devoted Christian member of the Church of God of the 7th Day in Freeland, MI, continuing to make the 45-mile drive after Wilbur’s death until it became too difficult for her. Myrtle is preceded in death by her husband of 62 years Wilbur, her grandson Charles Peasley, and ten brothers and sisters. She is survived by her daughter Joyce (Raymond) Brown of Helena MT, her daughter Donella (Ray) Peasley of Deford MI, her son Gerald (Katie) Foor of Vestaburg, MI, and her son Dennis (Roxanne) Foor of Lachine, MI. She is also survived by nine grandchildren, 15 great grandchildren, 2 great great grandchildren and seven brothers and sisters. Her family is eternally grateful to Donella and Ray Peasley for their loving care of Myrtle in their home during her last 2 and a half years of life. Memorials in Myrtle’s name may be made to the Shattuck Reunion Treasurer Kay Beard, 651 East Jerseyville Rd, Shepherd, MI 48883. Designated memorials will go toward an improvement to the camp facility where the Shattuck reunion is held of the Camp’s and Reunion Board’s choosing and toward a commemorative plaque. Viewing will be held from 4:00-8:00 p.m. on Sunday, December 2, 2018 at Smith Family Funeral Homes, 117 North East Street, St. Louis. A funeral service celebrating Myrtle’s life will be held at the St. Louis Church of Christ, 1075 W. Monroe Rd., St. Louis, on December 3, 2018 at 11:00 a.m. with a reception to follow in the church hall. Interment will be at the Richland Township Cemetery, Vestaburg MI at 2:30 p.m. following the reception for anyone wishing to make the extra drive and attend. Online condolences can be made at www.smithfamilyfuneralhomes.com The family is being served by Smith Family Funeral Homes, St. Louis, MI.